Shown above: 4 Ibiza Teak Sectional Center Chairs, 1 Ibiza Teak Right Arm Sectional Chair, and 1 Ibiza Teak Sectional Corner Chair. Merge functionality, a bold structural frame and thick plush cushions and you get the Ibiza sectional seating collection. 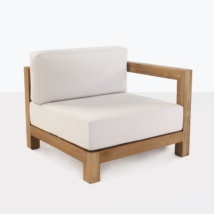 This versatile collection can be made into whatever shape or size you need for your outdoor space. Lounge on a long dramatic linear sofa or gather with guests on a popular L-shaped sofa. Keep it cool and contemporary with solid throw pillows or create a softer and cozy look with more delicate patterns and accessories. Shown in the photo above 4 center chairs, one left chair and 1 corner chair. 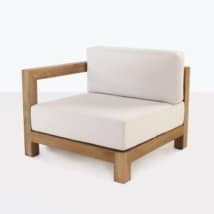 The quality is relentless with our a-grade teak furniture. 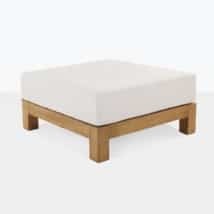 The Ibiza sectional is built with 316 marine grade stainless steel fittings and large solid chunks of a-grade teak and topped with Sunbrella cushions. The simple design of the frame allows the pure beauty of a-grade to shine. 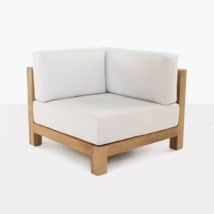 Email or call us today and we can help you plan what pieces of the Ibiza sectional collection will work for you. 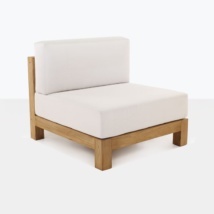 The pieces available are the Ibiza corner, center, left and right armchairs. The Sunbrella cushions are free as shown.